Dan Gookin employs his usual fun and friendly candor while walking you through the spectrum of new features of Word 2010. Completely in tune with the needs of the beginning Word user, Gookin shows you how to use Word quickly and efficiently so that you can spend more time working on your projects and less time trying to figure out how to make Word perform the tasks you need it to do. This newest edition of Word For Dummies explains how to navigate the user interface and take advantages of file formats, and skips the unnecessary jargon. 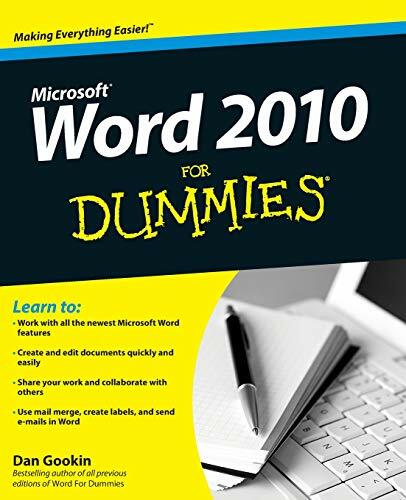 Unparalleled author Dan Gookin applies his beloved For Dummies writing style to introduce you to all the features and functions of Word 2010 Escorts you through the capabilities of Word 2010 without weighing you down with unnecessary technical jargon Deciphers the user interface and shows you how to take advantage of the file formats The word on the street is that Word 2010 For Dummies is a must-read!